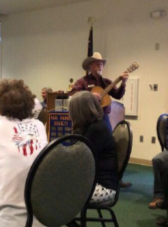 Steve Conroy of the Cochise Cowboy Poetry and Music Gathering serenades Rotary with some traditional Cowboy tunes. 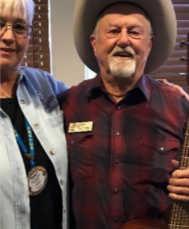 At last week’s meeting, we were entertained by Steven Conroy who is a musician, poet, and co-chair for the gathering called, Cochise Cowboy Poetry and Music Gathering. He was joined by co-chair George Wheat. As a singing club we were able to sing along to two songs and learn about the 26 year old festival / tradition in Cochise County. Additional Club guests included student of the month Jake Lane from Buena High School. Joined by his parents, family, and BHS Principal, Dawn Maddox. Jake provided an interpretation of the four way test by connecting those thoughts to his role on student government. Jake then presented the club a promotional video on a day of Being a Teen at BHS and living in Sierra Vista. The video took the audience from when Jake woke up through a fun filled energetic participation-rich in BHS Colt Pride, going to a game, being in the fan-fare at the game, and encouraging all to come see what it’s like being a teen in Sierra Vista. Jake stated that this video was presented for the 2020 bid this year at the conference, to have BHS host a Arizona Student Council assembly which would spotlight Sierra Vista and Buena High School across the State! Buena won the bid and we could not be more inspired and proud! Go Colts! Elsie MacMillen named Rotarian of the Month for Elsie was selected as Rotarian of the month because of volunteering to be on the Scholarship Commit-tee, volunteering to step in for Ken Stickler and her work on the Holiday Party. Congratulations to Elsie as well for being nominated as the top dealer for Toyota USA. Captain Carlos Souza of the Salvation Army was inducted as a new member of the Club earlier, and received his Rotary new member packet. This community partnership has always paid dividends as we enjoy volunteering to Ring the Bell each Christmas. Reminder that club payments can be made via credit card or debit card be-fore or after the meeting via Square. Please see Treasurer Angie Lakasarides. Please note we are DARK for Monday, February 5th at the Country Club only. SV Rotarians will be dazzled at the culinary stylings of Cochise College downtown campus. Please RSVP with Jerry Regan. Currently we are at capacity with 50 members attending the special showcase.